At around $1999 or $2000 whichever way you look at it, this TV is a superb value! Amazing how that one dollar makes it look so much less expensive. This TV has a top notch picture quality with excellent black levels and contrast. Colors are vibrant and pop off the screen giving three dimensional depth to images. A 55" LCD TV by the same manufacturer and same quality level sells for around the same. So you get 3" extra with the plasma and a little better picture. One tough competitor is the LG 60PS60 which is 2 inches larger and priced about $200 more. Panasonic will soon come out with the TC-P58S1. We expect these to be a solid performers as well, though lately Samsung plasma has been ranking better in picture quality. Up conversion from 480i: This signal test will let you know how the TV will perform with your digital cable or satellite signal as well as regular ole non blue ray DVDs. Up conversion processing was slightly fuzzy with a slight grain apparent from a 480i source signal. 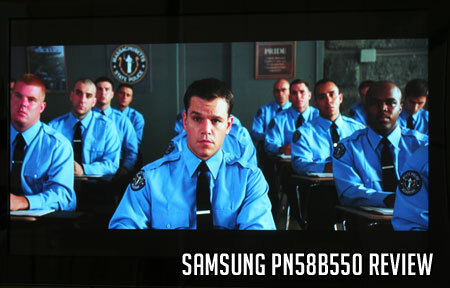 The Samsung PN50B550 has a tendency to make up for any deficiency in definition with accentuated color information. That said, color rendition is still pleasing and realistic. One slight drawback would be watching dark content in a brightly lit room. 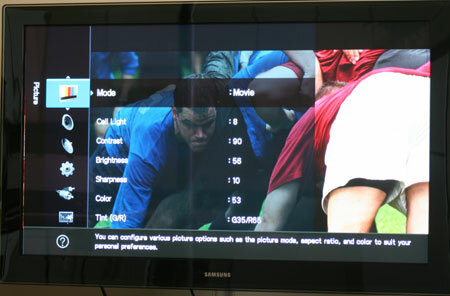 The Samsung B550 presents a very true, well calibrated but darker image and this combination darker content and brighter room light may cause some eyestrain. Solve the problem temporarily by turning the contrast up to 100%. 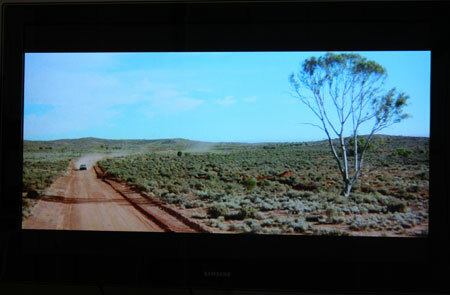 The Samsung B550 did a great job displaying plenty of color in the 480i 1997 Letterbox DVD of Risky Business. Another 480i DVD. Though the 58B550 displays on total a typically darker image it had no problems with this bright scene from Wedding Crashers. 1080p Picture Quality: In a darker, controlled light room environment this TV will absolutely please you with its quality image. It calibrates well, colors are healthily saturated and black levels/contrast make it shine with HD content. It was awesome with all HD content tested. And of course there is no motion lag and perfect viewing angles with plasma TVs so no issues there to even mention. 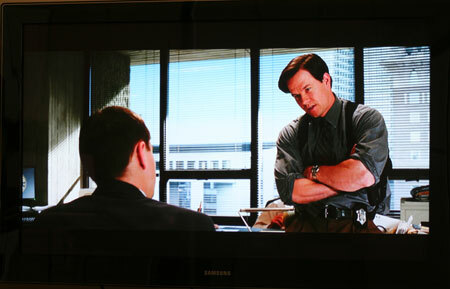 Blacks are rich and deep in this difficult (to display) scene from the Blu Ray version of The Departed. There was no dithering or flicker in the background blinds. Black Level/Contrast: Black registered a very impressive .06 average luminance in our contrast ratio test. It's impressive and inky and you notice it with almost all content. The Pioneer KURO blacks were world renowned, but this is close. Post calibration ANSI checkerboard contrast measured one of the best recent results at a heroic 1383:1. Dark Shadow Detail: Though blacks are intense, dark shadow detail was not impaired by oversaturation – an excellent result with all content. 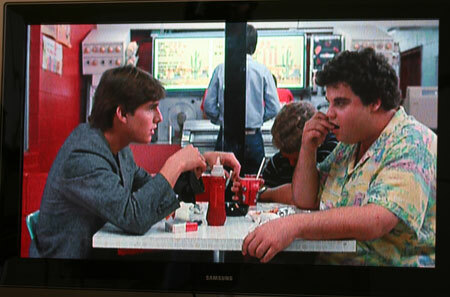 The Samsung B550 excelled in displaying shadow detail in this tough dark scene from the 480i version DVD of Risky Business. Color Rendition/Color Accuracy: Flesh tones are natural and err on the saturated side as does all color information. Colors are vibrant and lively. Color rendition was plenty saturated as in this shot from the Blu Ray version of The Road Warrior. Viewing Angle/Off Axis Viewing: Perfect result here. Motion Lag: No motion lag in plasma. False Contouring/ Mapping: Through viewing many dark gray scenes there was no mapping or false contouring present – an impressive result for an occasional plasma problem. Video Aspect Ratio Sizing: The P. Size button on the remote controls aspect ratio options. The B550 did a fine job of algorithmically managing the picture size through options, 16:9, Wide Fit, 4:3, Screen fit. Inputs: 4 HDMI, 2 Component, 1 PC input. Aesthetic Considerations: A slight drawback to the B550 might be its somewhat 2008 looks. The bezel is too wide for my taste at 2.5 inches on the sides and bottom and oddly out of balance 2.25" on the top. Other drawbacks are a good bit of glare from both the wide frame and the overlay screen. This screen overlay though is part of the reason for those excellent blacks so give it a pass. A couple of positives are the slight 3" depth of the TV which makes it great for wall mounting – especially impresive for a 58" TV. And if you choose to place it on a table instead, you'll be pleased with the side to side swivel table top stand. Remote Control/Menu Funtionality: The remote is very nice, back lit with easy to use large buttons. The B550 series remote thankfully does not have the cumbersome scroll wheel as some other Samsung models. Picture: The menu system presents itself as an overlay with a convenient tutorial feature appearing in the bottom of the screen. The menu is thorough enough if not a bit tedious to maneuver around. Audio Output: Audio output was impressive from the 15W X 15W speakers. There was plenty of volume to fill a large room at the 50% level. Use the Clear Voice feature as much as possible for added voice definition. We're big fans of this while the SRS TruSurround doesnt seem to accomplish much. Features: P. Mode button controls preset picture modes movie, standard, vivid. 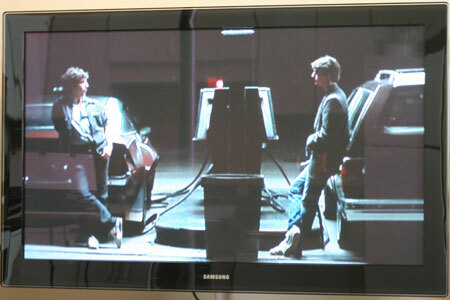 We calibrated the TV from the movie setting. Clear Voice is a favorite feature of the B550 series as is the swivel table top stand. Each input has discrete picture settings which is always a plus, but remember to use our calibration settings for each input you intend to use. Energy: The TV received the energy star rating. The power consumption rating is 540 watts. Review Equipment Used: Sony Blu Ray BDP-S1 High Definition DVD player, Sony DVP-S50 DVD player, Comcast Digital Cable, Sencore Color Pro 5000, Sencore Auto Cal Pro, Sencore signal generator.